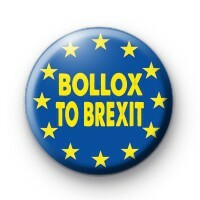 This blue & yellow European Flag Button Badge has the text Bollox To Brexit written in the centre in a yellow font. Our EU badges have been really popular since the European Union referendum in the UK & subsequent Brexit negotiations. The European flag symbolizes both the European Union and, more broadly, the identity and unity of Europe. We have lots of other Pro EU designs in the shop so make sure to check those out too.